Eagle vs Shark is a film which never actually mentions the words "Asperger's syndrome" but is clearly about two individuals with Asperger's meeting and and falling in love. In fact, it takes the whole genetics thing so far that at times, it feels like nearly everyone in the film has it. Eagle vs Shark (2007) is a Kiwi (New Zealand) film which is at times very awkward to watch, It's described as a comedy but feels like a comedy/drama/art film. "Finding love was never so... Awkward." In a way, I found these taglines somewhat offensive because they concentrate so much on the "unattractiveness" of the main stars instead of on the traits that make them different enough that they find it difficult to find love. 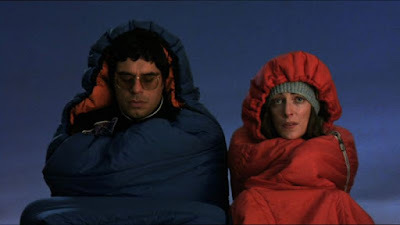 The two main characters, Jarrod and Lily display a lot of Asperger's traits and like other "awkward" films about characters with Asperger's syndrome (Napoleon Dynamite for example) these traits have been turned up to a "maximum". The traits and stereotypes in the film are much stronger than you'd find in real life but they're nevertheless fairly common. This is particularly apparent in the way that the two characters speak in mostly stunted, closed sentences and rarely follow up on what the other person is saying. Sometimes it feels like they're having separate but similar conversations in the same room. There's also a monotone through their conversation which strips them of nearly all emotion. Lily's character displays a few other traits, particularly a coping mechanism where she goes down to the local playground and runs in a tube. There's a lot of general awkwardness and there's a clear lack of social understanding. She's also picked on by her colleagues in the workplace. Lily spends a lot of time in enclosed costumes, with both the shark costume and her sleeping bag being over-used, liking that "wrapped" feeling is a pretty common Asperger's trait. Jarrod's character shows very low emotional intelligence, he concentrates on his own feelings and completely misses cues from those around him. Everything Jarrod does is self-focussed. His words and actions hurt others but he's mostly blind to the hurt he causes. Much of Jarrod's story is focussed around him wanting to get revenge on a school bully. As it turns out, the bully has forgotten everything about the bullying incidents but Jarrod can't let go. Again, this is a very common trait amongst people with Asperger's syndrome. They can't let go of some things - and they affect them very deeply indeed. Jarrod's actions are awkward and at times quite shocking but all the more believable because they are. I've met many people with Asperger's syndrome who are exactly like Jarrod. Even the background characters, like Lily's brother and Jarrod's friends have a number of Asperger's traits leading you to wonder if the whole town is affected or if it's just that people with Asperger's syndrome tend to attract others who are similar. Movie quotes are tossed around casually and there are some great moments where Lily's brother Damon tries to impersonate Arnold Schwartzenegger. It's a weird watch but it's worth it. 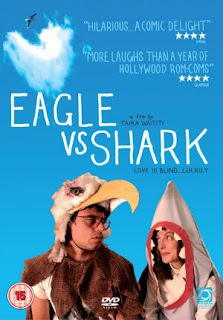 Eagle vs Shark is available on Amazon and Google Play and presumably in stores. "Even the background characters, like Lily's brother and Jarrod's friends have a number of Asperger's traits leading you to wonder if the whole town is affected or if it's just that people with Asperger's syndrome tend to attract others who are similar. " I didn't see the movie. Are these traits behaviors? I ask because behaviors can also be *taught*. When a whole bunch of people in the same community do some of the same behaviors, there's a possibility that some of them taught those behaviors to the other ones as part of that community's culture instead of their DNA. http://nymag.com/news/features/asian-americans-2011-5/ has some stuff on that IRL - the author talks about how some people in his subculture are taught to have poor social skills by their families.